If you want to get the best of design, comfort, and technology in your trimmer, there is probably only one brand that you need to resort to – Philips. 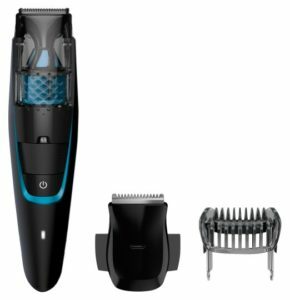 The new Philips BT7202/13 Series 7000 Beard and Stubble Trimmer is one of the most sophisticated models available in the market today. It comes with an integrated vacuum system, which means you don’t have to be concerned about the mess that your trimmer creates in the form of hairs all over your floor, sinks, counters, etc. This instrument absorbs up to 90% of the cut hair, which is a huge relief for you. This beard trimmer was first available February 2016. Read through the beard trimmer review to know more about the exciting features of this product. Can be used as corded or cordless models. A sixty minute charge should last you for one hour of trimming time. Can be used to shave your head bald if you need. With the built vacuum system this beard trimmer will save you a lot of time if you decide to trim your facial hair every day, because you won’t have as much clean up to do. 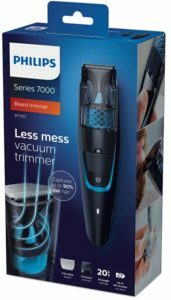 The BT7202/13 Series 7000 Beard and Stubble Trimmer from Philips is one of the highest-quality and durable trimmers in the market. It currently sells for around £48 online, and is a mid level model for Philips between the BT5200/13 and Philips BT9280/13. It is coming in at a very high 4.4 out of 5 stars with 89% of the ratings with four stars or higher. There are currently very few negative reviews and with the beard trimmer being introduced in February of 2016 this speaks very highly, and we recommend this beard trimmer as one of the best beard trimmers for sale. The biggest problem with this device is the design of the cutter module. The fingers used to attached the cutter to the body of the trimmer are the weakest point in so far as both of these have snapped on my unit. The cross sectional area needs increasing to prevent these very fragile fingers from breaking. Philips do not make spares for this device and therefore the unit is scrap.